"Tomorrow the killing begins, and God help me, I can't think of any way to stop it." Due to the nature of this series, this review will necessarily include spoilers for earlier seasons. Read at your own risk. 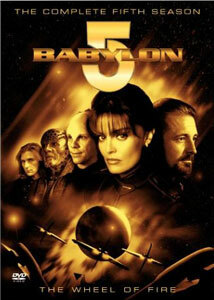 Babylon 5 was a rather unique concept for a series; originallly conceived as a five-year run, it actually managed to make it all five years and ended as creator J. Michael Straczynski had originally planned. Unfortunately, doubts at the end of the fourth season as to renewal for the last one led to the principal storyline involving the Shadow War and the Civil War with Earth to conclude early, even though those storylines were intended to be wrapped up in the fifth season. The resulting segmentation of the story unfortunately led to a complete loss of momentum as the fifth season began. It takes at least half a dozen episodes to really work things up again, and they hardly get going before it's time to close up the shop; perhaps stretching the story out to six years might have worked to make a more integral whole. That's not to say that this is bad television; it's still first-rate sci-fi drama, with compelling characters and always interesting story lines. We pick up with the story of space station Babylon 5 in the year 2262 as Sheridan (Bruce Boxleitner) has ascended to the presidency of the Interstellar Alliance. A new captain, Elizabeth Lochley (Tracy Scoggins) is installed, and she immediately raises suspicions since she may have been on the wrong side of the Earth civil war. A group of telepaths, led by the charismatic Byron (Robin Atkin Downes), are given sanctuary on Babylon 5 by Sheridan, who has retained control of political issues over the station, but the Psi Corps doesn't intend to allow them to remain both free and alive. Meanwhile, a mysterious series of attacks on Alliance shipping threaten to shatter the fragile confederation before it can get itself established. G'Kar (Andreas Katsulas) is becoming a messianic figure, and finally comes to an understanding with Londo Mollari (Peter Jurasik). It's amazing how the characters evolved over the five seasons; particularly noteworthy is the change in G'Kar, who started off thoroughly unlikeable and through his arc became one of the most fascinating characters in science fiction. There is some repetition, however, as a thread involving the alcoholism of former security chief Garibaldi (Jerry Doyle) more or less retreads the drug addiction suffered by Dr. Franklin (Richard Beggs) in Season Three. That notwithstanding, there's plenty of inventiveness on display here, which is all the more amazing considering 21 of the 22 episodes were written by Straczynski (who also directed the final episode). The exception,Day of the Dead, was written by famed comics scribe Neil Gaiman, and it's one of the best of the series as characters who have died return to take care of unfinished business; for long-time viewers it's highly rewarding and a fascinating look at the resonances that run throughout the entire series. The regulars are all well-established in their roles by now, and it's hard to imagine anyone being able to do them better. Patricia Tallman, as the telepath Lyta, and Jeff Conaway, whose Zack Allen is promoted to security chief of the station, get some of the most effective character growth here. Zack has come a long way from his temptation to become a blackshirt in Season Two, and Lyta's exponentially increasing abilities make her a study in the corrupting influence of absolute power. The oft-referenced comedy team of Rebo and Zooty finally actually show up on the station, in the persons of Penn and Teller. The tragic aspect of Londo Mollari's ambitions turn to full circle this season, as he both gets all the power he could ever want, but every choice is taken from him. I never did quite warm up to Tracy Scoggins, since her pained-model expression hardly seems appropriate for a career military commander; she doesn't have quite the grit of Susan Ivanova (Claudia Christian). The CGI that is used heavily throughout the season generally holds up very well even after a distance of six to seven years. The action quotient is rather lower, with only two episodes really getting into serious sci-fi warfare, though there's an occasional use of blasters sprinkled here and there as well. This is in part intentional, since one of Straczynski's stated aims was to not only consider the central wars, but also the aftermath. One of the clear and prescient lessons here is the notion that while winning a war may be difficult, winning the peace can be even harder to accomplish. Perhaps it should have been required viewing for the Iraq planners. The final three episodes are almost entirely devoted to saying goodbye to the characters; even though it's a bit drawn out the finale is nonetheless deeply moving. This season is by no means a jumping on point for new fans, but for those who have followed the series through the first four years it's nonetheless hard to let the characters go. Image Transfer Review: The anamorphic widescreen picture for the most part looks sharp, crisp and excellent. The exceptions are the opticals, which have a third-generation softness to them that's pretty much unavoidable. Similarly, the CGI sequences often suffer from aliasing, but that may well be inherent in the source materials. Color is vivid and natural in tone, with nice solid blacks. Edge enhancement and ringing are seldom noticeable. This looks very nice indeed, considering all factors. Audio Transfer Review: The original Dolby Surround audio is remixed into a fairly aggressive 5.1 track. Christopher Franke's music sounds terrific, with deep, deep bass extension and excellent definition. The occasional explosions are again house-shaking in their impact. Hiss and noise are hardly noticeable. Dialogue is quite clear throughout. Nothing at all to complain about here, other than the mixing is a bit on the loud side, making reference level listening a shade painful. Extras Review: The usual assortment of extras are continued here. Straczynski provides an introduction to Season Five, as well as commentaries on two episodes (including the series finale). His comments are still interesting and thoughtful and well worth listening to. The cast commentary on episode 17, Moments of Fire and Shadow is less informative but it's pretty entertaining and the foursome are clearly having a good time reminiscing about the series. Two featurettes, each about six minutes long, respectively address the use of CGI and the response of B5 fandom to the series. A set of three deleted scenes from the finale help fill in a few character details, and they're certainly welcome. This would have been a good opportunity for seamless branching to allow the finale to be played with these segments, but if there's a way I couldn't find it. What I could find is an easter egg in the Data Files section that discusses the fate of Marcus Cole, left unresolved at the end of Season Four. Short bios of Straczynski and the executive producer are accompanied by brief notes on various races, characters and events. Finally, on the episode menus one can also play each of the teasers for the next episode. It's about a perfect balance between too much and not enough for a fifth season of a series. A fitting finale to the series, despite a loss of momentum due to unfortunate timing. But the transfer is very solid, and there are some good extras. Fans will certainly want to own it to closely examine the resolution of various prophecies that have peppered the first four years. I truly hated to see it end.